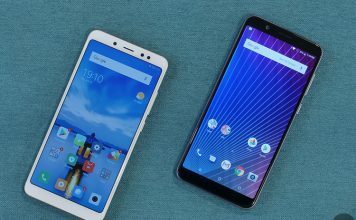 Before starting off with the gaming, we put the hardware to the test by putting it through some of the standard benchmark tests to get an approximate idea of how the device stands in comparison to its main competitors, including the Xiaomi Redmi Note 5 Pro. While testing the device, we found a minor increase in the overall performance of the ZenFone Max Pro M1, thanks to the extra RAM it packs. The device managed to post a decent score in AnTuTu, leaving the competition behind by a couple of thousand points. It also fared quite well in Geekbench 4, however, the difference between the scores wasn’t as significant. 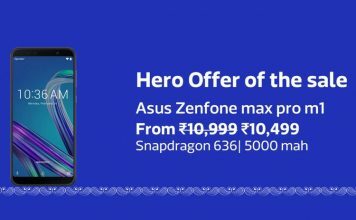 The ZenFone Max Pro M1 managed to score an impressive 115299 in AnTuTu, leaving behind the 3GB variant which scored 112535 and the Redmi Note 5 Pro which scored 112194. In Geekbench 4, the device managed to muster up 1333 in the single-core test and 4870 in the multi-core test, which is also slightly better than the other two devices. 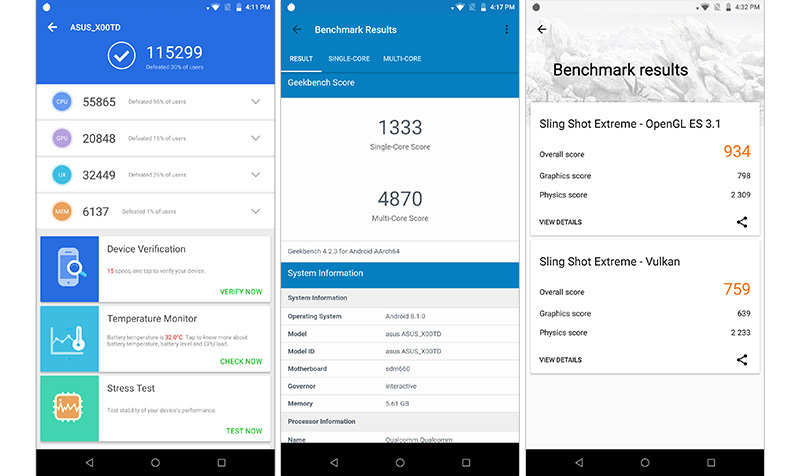 In order to further push the device’s limits, I also ran 3DMark on the ZenFone Max Pro M1 6GB and it managed to score a decent 934 in 3DMark’s Sling Shot Extreme OpenGL ES3.1 test and 759 in Sling Shot Extreme Vulkan. While synthetic benchmarks are great for getting an initial idea of a device’s performance, they aren’t enough to draw a complete picture of the device’s performance. Therefore, we ran a bunch of demanding games on the ZenFone Max Pro M1 to test its real-world performance. I played PUBG Mobile, Asphalt 9: Legends, Shadowgun Legends, and Tekken on the device, all of which are quite demanding games. 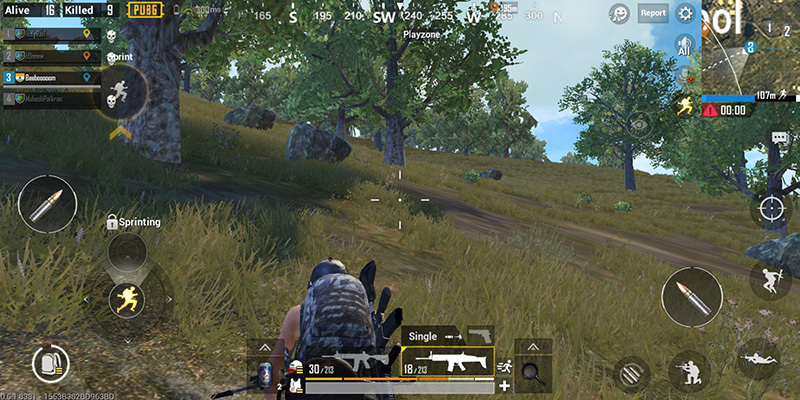 In PUBG Mobile, the ZenFone Max Pro M1 automatically picked up the medium graphics settings and I encountered no lags or frame drops during my time playing PUBG on the device. In comparison, the 3GB variant of the ZenFone Max Pro M1 selected the lowest graphical setting and stuttered if I selected the medium setting manually. 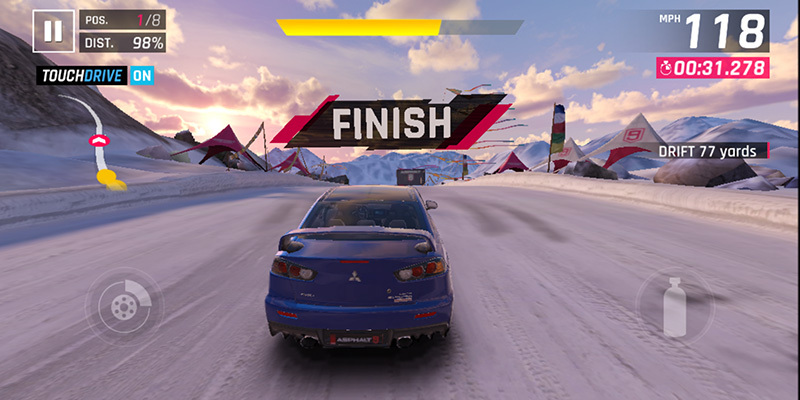 The device had absolutely no issues running the latest Asphalt game, Asphalt 9: Legends, and I had a pleasant time driving without worrying about frame drops and stutters. 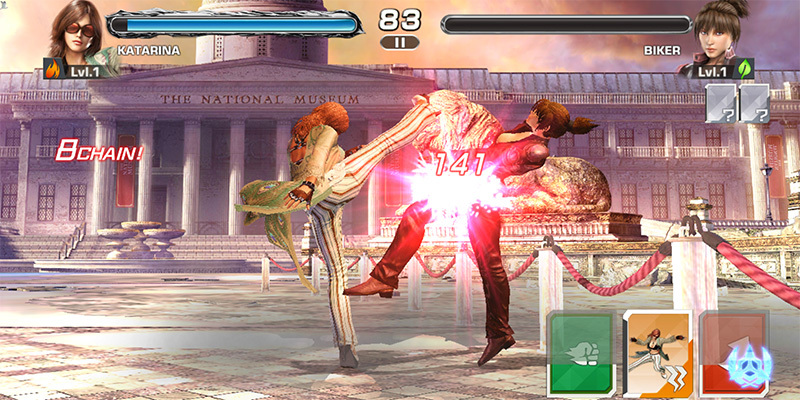 I initially tested the game on the default settings, however, when I cranked it up to the high quality setting, I noticed that the device started dropping a few frames during intense legs of the race. Next, I powered up Shadowgun Legends on the device and as you’d already know, the game is quite demanding. 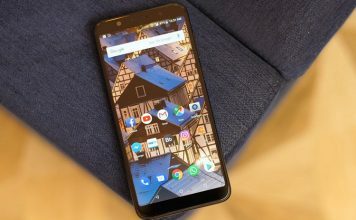 The ZenFone Max Pro M1 pushed forth undeterred and the game performed quite well, with just a few frame drops that didn’t really have a bad effect on the overall gameplay. The ZenFone Max Pro M1 didn’t even break a sweat running Tekken and I was quite impressed by the performance of the device, to say the least. 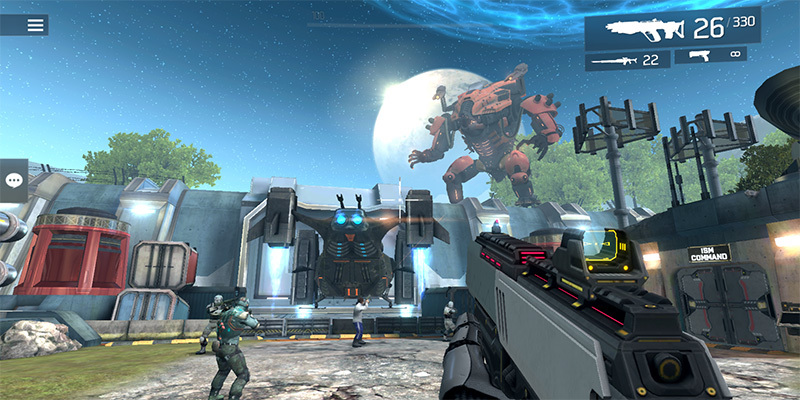 However, it did take a fair bit of time to load up the game for the first time. Another thing that I’d like to mention is that the extra RAM really helped the device hold all the games in memory and I could easily switch between the games without the device having to load them up every time I switched. My gaming experience on the ZenFone Max Pro M1 was rather satisfying and I’d definitely recommend the device to anyone who’s looking for a budget smartphone that can run the newest games with relative ease. 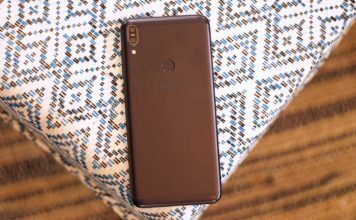 Once again, the ZenFone Max Pro M1 6GB is definitely worth the price if you’re looking for a budget smartphone that can play modern games with relative ease. The device has absolutely no issues running even the most demanding titles and the 6GB RAM really goes a long way in helping the device hold the games in memory, so that you don’t have to wait for them to load up from scratch. On top of that, the smartphone’s massive 5,000mAh battery would really work in the favor of gamers as it would provide enough battery life on a single charge to play for at least a couple of hours before you need to charge the device. Priced at Rs. 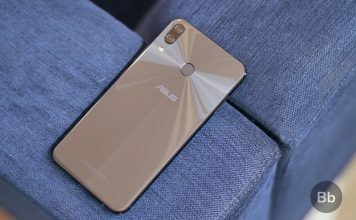 14,999, the ZenFone Max Pro M1 might just be the best budget smartphone for gamers out there.